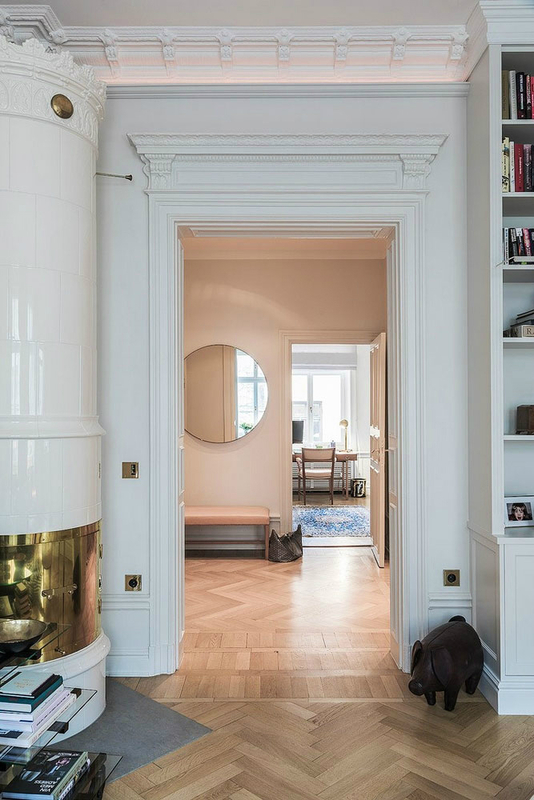 Lovers of Parisian style will adore this sleek Swedish apartment! 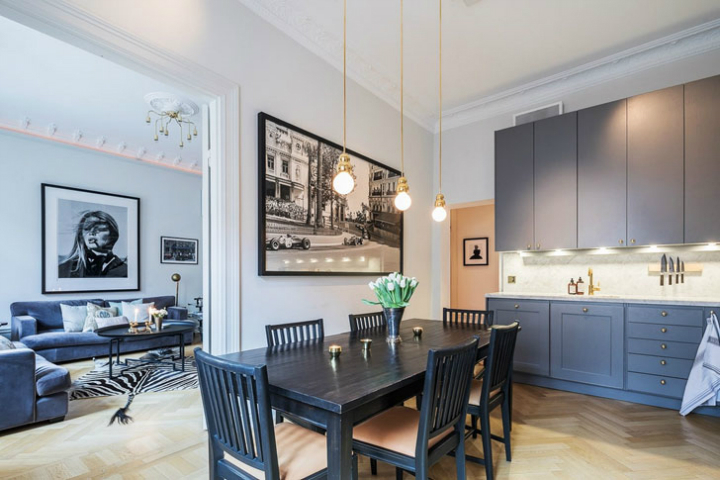 We’re checking out the design of this Stockholm apartment to see what makes it tick. 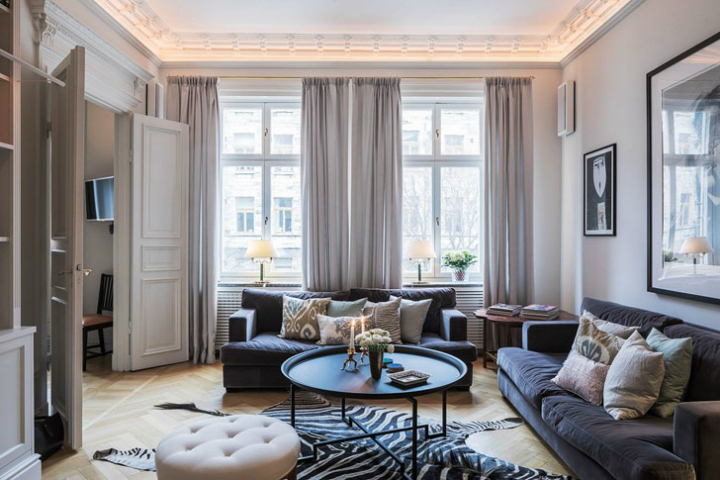 If you love European design, you’ll definitely be intrigued by the interior design of this space. French windows open up the living room, letting plenty of light in. 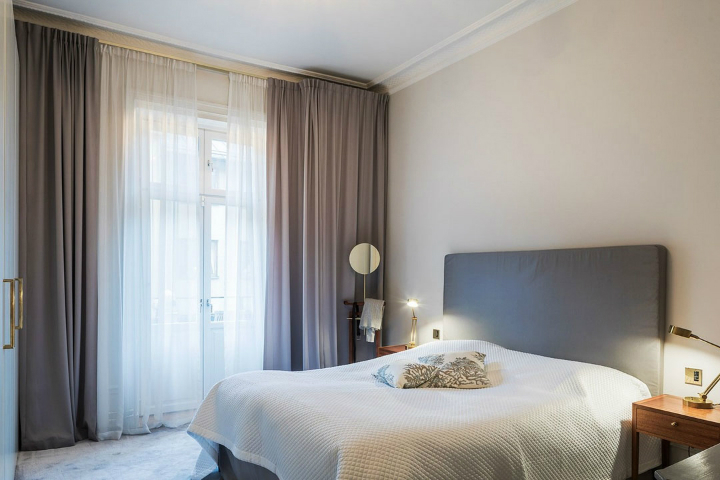 Accent your home with the long, light gray drapes seen here. 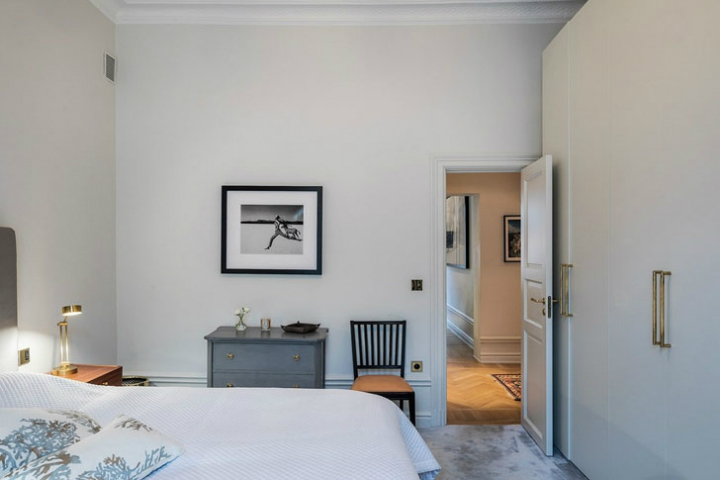 This room has a mostly gray and white theme, with very light gray walls and wooden floors. 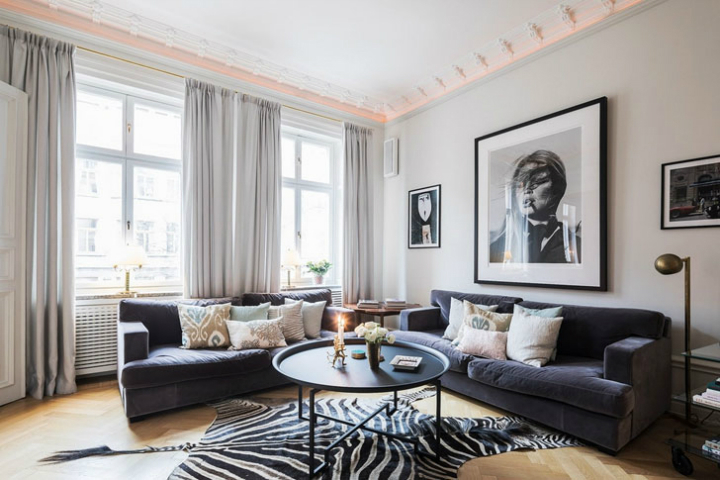 A plush blue-gray sofa or two like the ones seen here with patterned throw pillows are your seating, with a circular dark coffee table and a brazen zebra-pattern rug and a white footstool to anchor the room. 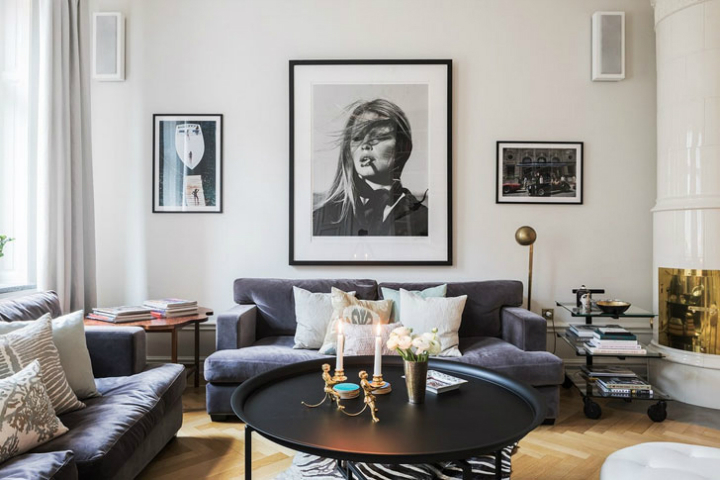 Bring everything together with a larger than life framed black and white photo or favorite piece of art behind your sofa with smaller ones to either side as seen here. 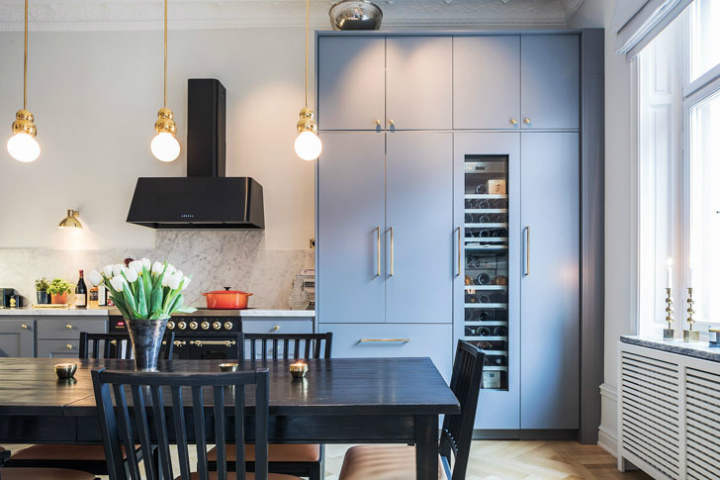 On to the kitchen, where a black kitchen table and chairs and blue cabinets dominate the room. 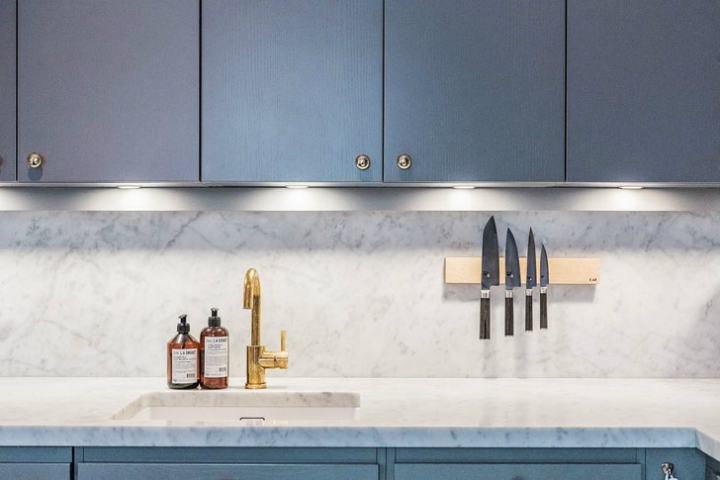 This is counteracted by the light white walls, but the lighter blue cabinets provide a nice balance between the light and dark. 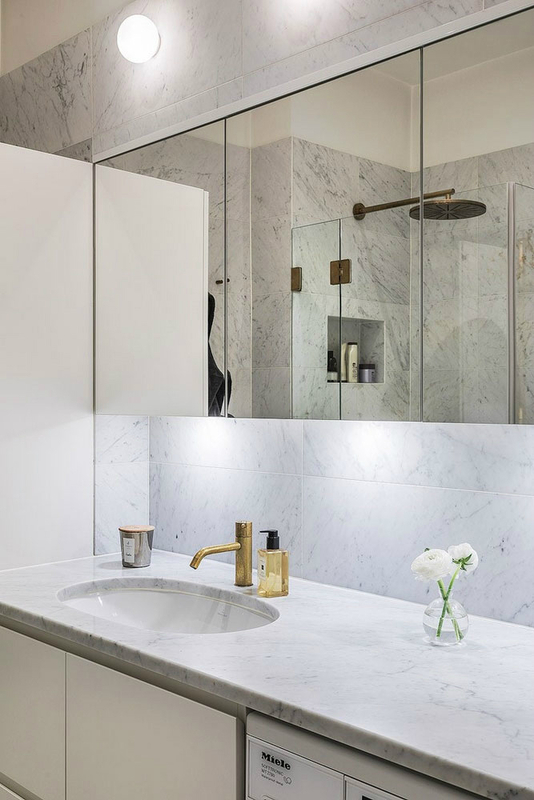 Smooth white and gray marble countertops make hanging out in this room with a glass of wine seem like the thing to do. Three elongated hanging gold lamps above the table, gold knobs, a gold sink and a framed photo lift up this room and keep it from being too weighted down. This apartment really drives home the clean look with mostly white walls and adding on top of that. It’s almost like the space is a literal canvas and items are being judiciously added one by one. There are little quirks, like having one large and one small square photograph hanging in the hallway, or a matching gray headboard and curtains in the master bedroom with calming taupe walls and a waffle blanket over the bed. 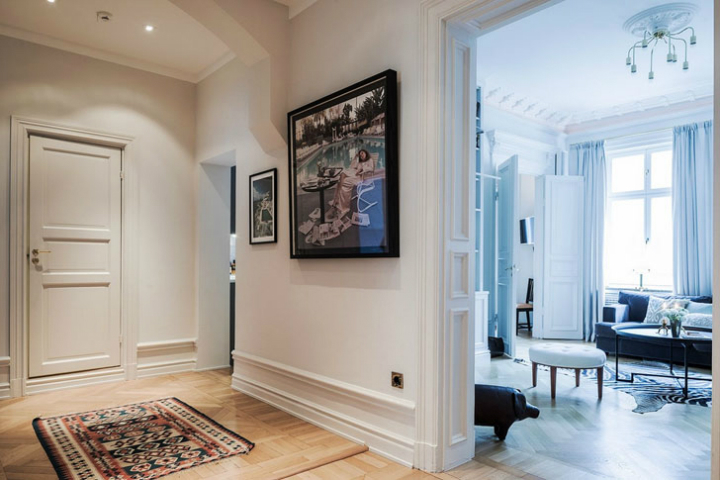 The alternating imitation marble and wooden floors really warm up what might be an otherwise sterile look. 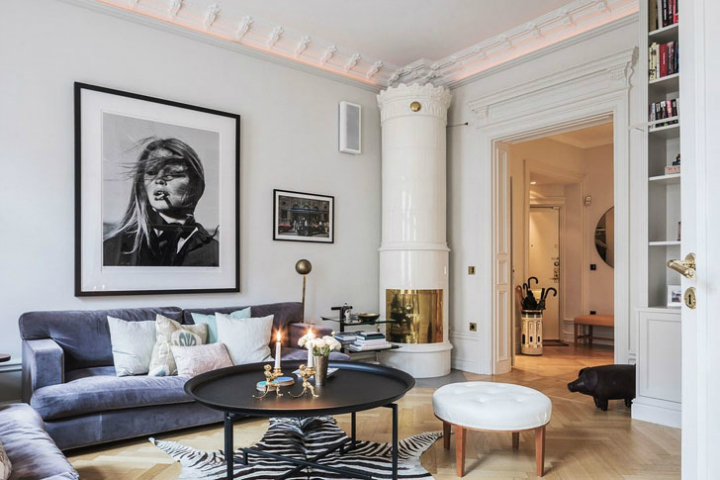 A rounded mirror or piece of art in the right place doesn’t hurt either! 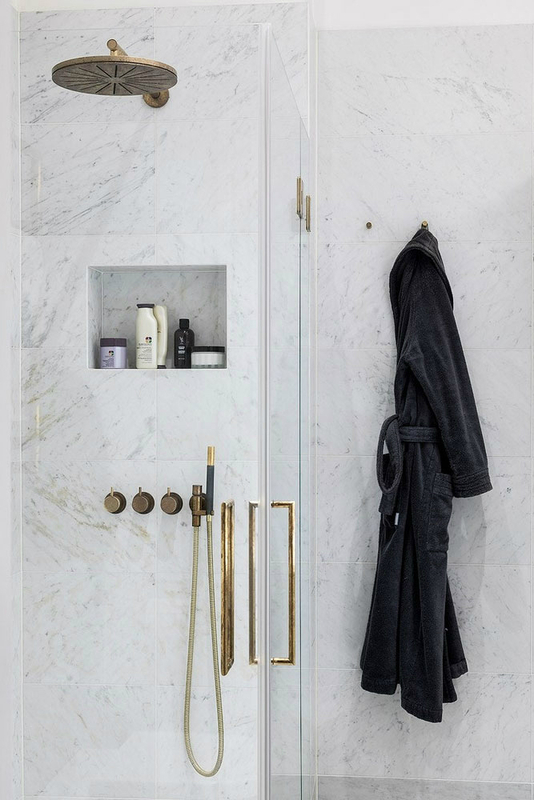 And of course, why not make most of your bathroom marble instead of just part of it? 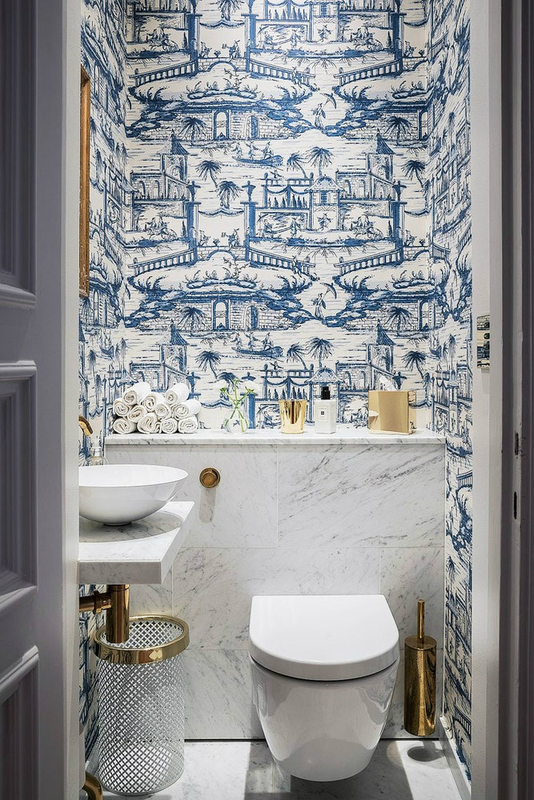 Whether imitation or real, using marble for your sink counter, shower and walls creates a uniform, monochrome look that is broken up by select bronze fixtures… and in the bidet area by lively indigo patterned wallpaper. 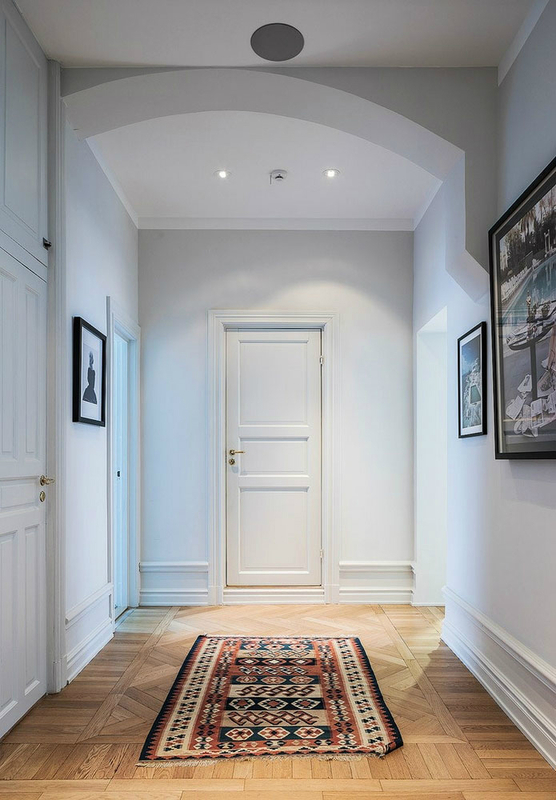 Lastly, show your guests to the door with this smooth, patterned wood floor and a rectangle throw rug on top. European style has never looked so good! 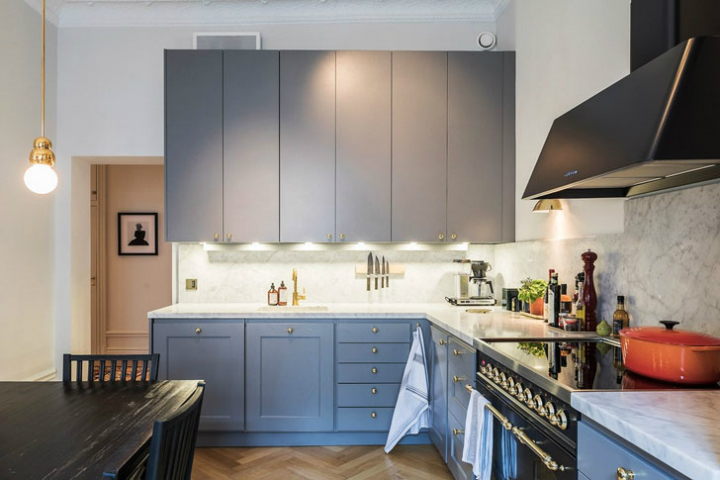 Do you love the finished look of this apartment? What aspects did you like most? Feel free to comment below and share your design thoughts!